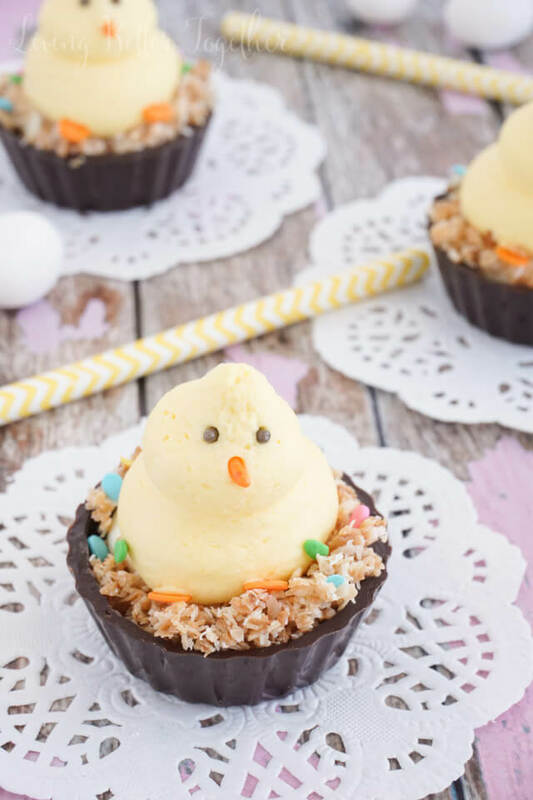 These Easter Chick Mousse Cups are so fun and easy to make! 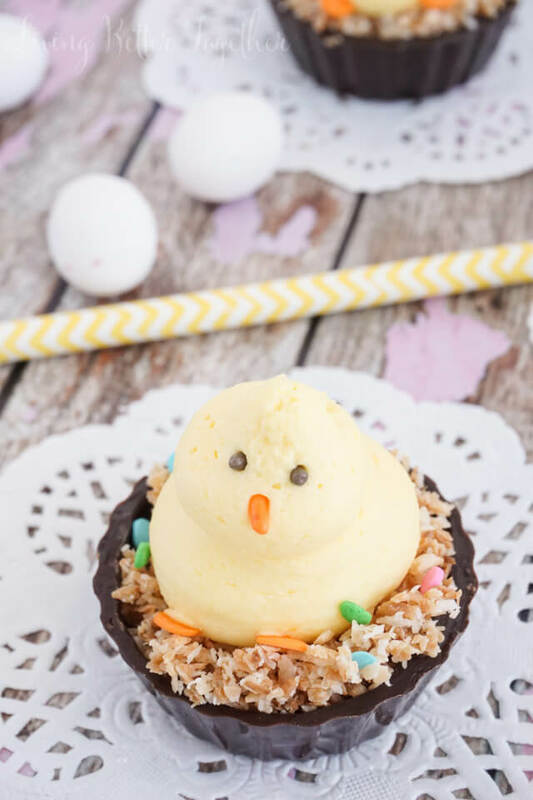 A simple vanilla creme mousse and toasted coconut tucked into a Belgian chocolate cup and decorate with sprinkles. With Easter just a week away, it’s time to start planning out that menu and filling those baskets! But instead of a traditional dessert like this Sea Salt Caramel Carrot Poke Cake, why not whip up something fun and festive! These little chicks are just the thing, and even though they might look hard, they’re actually really simple. The kiddos will love them and your adult guests will most definitely be impressed with your creativity. 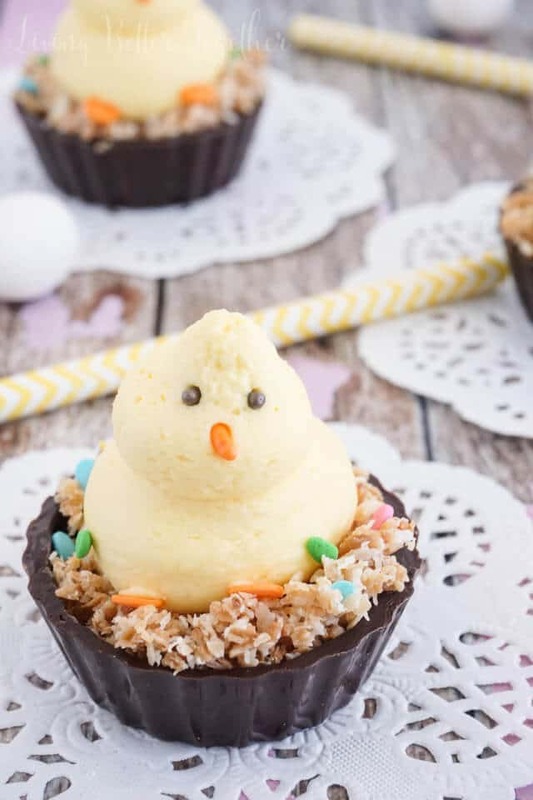 Made with a “cheat” mousse, premade chocolate cups, toasted coconut, and sprinkles, these little bites of sweetness are almost too cute to eat. It’s a hard job, but someone’s gotta do it, right? 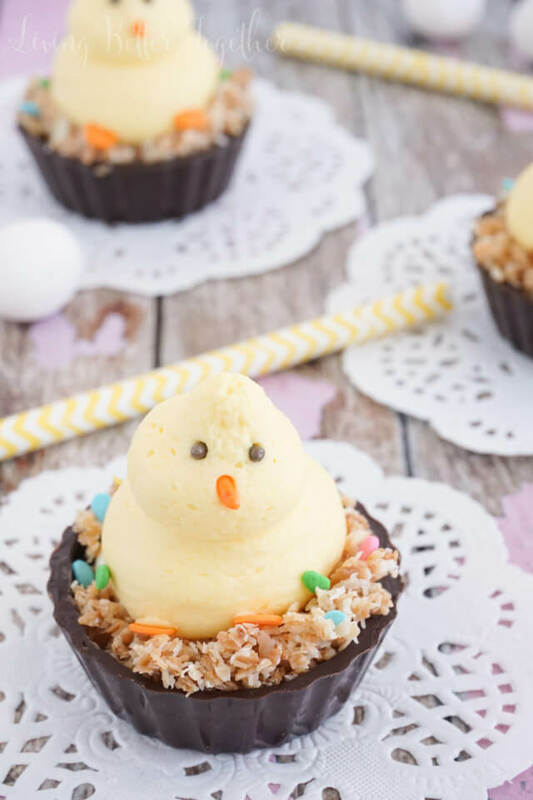 If you’re looking for something that’s still easy but a little bit more elegant, check out these White Chocolate Mousse Nests. So what’s everyone got going on for Easter this year? When we were in college, we always just took it as a “chill” day. Life was crazy then, not that it isn’t now, and running back and forth between two families that were already an hour away just didn’t sound like a good time. This year, my inlaws will be out of state for the holiday as I mentioned in my Easter Sundae Pudding Bar post. So we’ll be spending the day with my family. At least that means I’ll only have to think up one dessert and maybe a side. I’m thinking of going a little non-traditional with it and doing a French Silk Pie and some Coconut Dinner Rolls. I’d love to hear about your Easter Traditions! 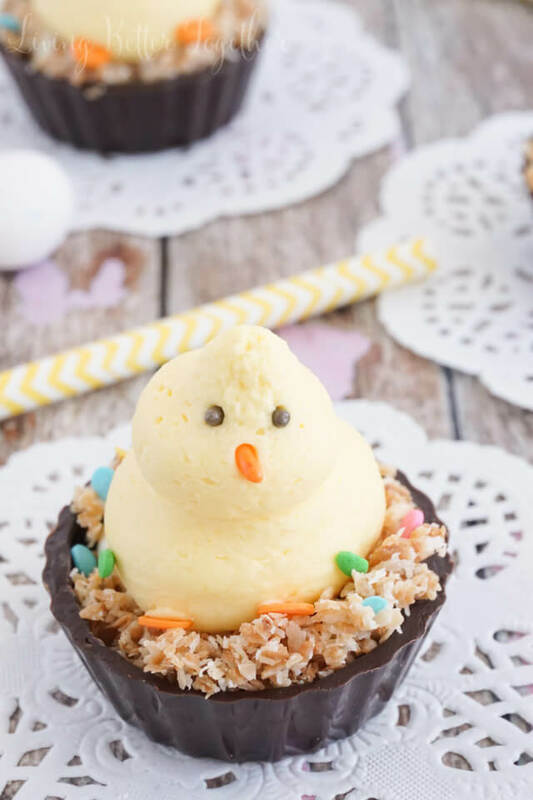 These Easter Chick Mousse Cups are so fun and easy to make! A simple vanilla creme mousse and toasted coconut tucked into a Belgian chocolate cup and decorated with sprinkles. Add heavy cream, pudding mix, food coloring, and confectioners' sugar to a stand mixer fitted with a whisk attachment. Whip until light and fluffy, about 2 minutes. Spread coconut out on a baking sheet and broil on low until golden brown. Keep a close eye on it so it doesn't burn. Using a large circle tip, pipe mousse into the cups just enough to fill up the bottom. Sprinkle first layer of mousse with toasted coconut to make a nest. 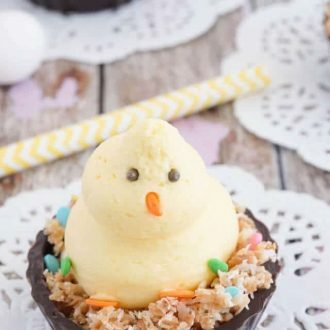 Pipe a dollop of mousse onto the nest and then a smaller dollop on top of the larger one to make your chick's body. Press in an orange sprinkle to make your beak. Press two brown sprinkles in almost all the way to make the eyes. Use two orange egg sprinkles to make your feet, or you can use three sprinkles per foot to make toes. You can use white chocolate or lemon pudding mix too. You can find the cups at Walmart or Hobby Lobby. Inspired by The Simple Sweet Life. These are seriously adorable – I love this little guys face. Terrific idea!